With all this talk about renewable energy sources, one area that's often been overlooked is how to we get energy from one place to another. Our current electrical grid relies on century-old technology and is degrading in many parts of the country. At some point, our infrastructure will need to be upgraded to improve efficiency and ensure that it can handle our high tech supply and demand. A smart grid is an electrical grid that utilizes two-way communications, advanced sensors, and distributed computers to improve the efficiency, reliability, and safety of the electrical grid while allowing homes to be intelligent consumers and producers of electricity. This is the first major overhaul to the electrical grid since it was created in 1888. It is currently being implemented in small parts all over the world, but will need to be a global change. There are currently millions and millions of homes, businesses, and industries that need electricity of constantly changing amounts from the many thousands of power generation sources all spread over large distances. This electricity is generated in response to demand and then pushed to the electrical grid, where those who need it can use it. This system has very little in the way of feedback and uses very little of the technology that has revolutionized nearly every other industry in the last two decades. A smart grid is a grid that uses real time information from millions of sensors and a rapid method of communications to understand the supply, demand, and health of the the grid. It is also capable of better incorporating electricity generated by small scale renewable energy sources and interacting with homes, as well as individual smart appliances. 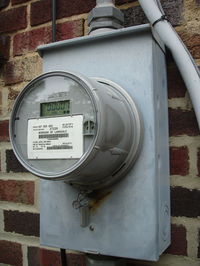 These systems connect with homes through products called "smart meters" , which take the place of typical electrical meters connected to every house that is on the grid. These are connected to the utilities through a system similar to the one that delivers you internet. They are able to tell the utility company how much energy you are using and if there is an outage, among other things. Rather than having someone come check your meter once every few months, you and the utility company will be able to see how much energy you use in real time. Smart meters provide for more information about supply and demand and also allow a lot of things to happen that save money and energy that would've never happened before. Imagine a situation where you can tell your dishwasher to run while you are at work whenever demand for energy is low, so that the energy company will charge you less for the energy you use. Not only does this save you money, but it also saves energy. Another scenario is where the utility company, rather than turning on an inefficient power plant when demand spikes, instead pays someone to shut off something for a short period of time. For more on how this happens, check out the Why Its Important section.